The wires of the pneumatic world are tubing and hoses. Here’s how to choose between the two, and how to apply each in industrial plants and facilities. 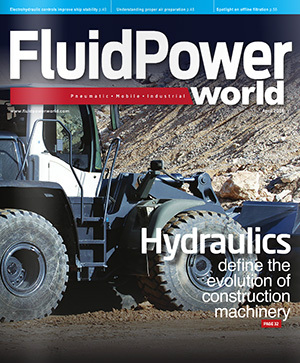 The world of fluid power may not be full of new and amazing products, but it’s used daily and requires connections via tubing and hose. Starting at the air compressor, fluid power is distributed through pipes to plant or area filters and dryers, and then on to machine air preparation systems. Once compressed air lands at the machine, tubing and hoses make connections to valves and cylinders. Tubing, hose and related fittings—often sold in bulk—are the final pieces to plumb and connect pneumatic devices. This article looks at some differences between tubing and hose, and discusses related fittings. Best practices for design, selection and implementation are also covered. NITRA pneumatic tubing, hoses and fittings are available from AutomationDirect in a variety of materials, sizes and colors. Modern pneumatic systems for industrial automated machines typically don’t use rigid connections, but instead use flexible tubing or hose, available in many different types. Tubing is specified by outside diameter—for compatibility with push-to-connect fittings. Hose is specified by its inner diameter, and is typically sold with swivel, rigid, or quick-disconnect fittings attached at both ends. Typical tubing is an extrusion of polyurethane, nylon or a specialty material like PTFE. Tubing used in automation is typically less than 1 in. outside diameter (OD). Common tube OD ranges for main supply circuits is 1⁄4 to 1⁄2 in. Pneumatic control circuits to cylinders and actuators often use smaller diameters in the range of 1⁄8 to 3⁄8 in. tube OD. Metric OD tubing is also available in a common range of 6 to 16 mm. Tubing is usually sold in rolls of 100 or 500 ft. It is good practice to use all English dimension or all metric dimension pneumatic tubing on a machine and in a plant. Coiled and bonded tubing are available in a similar range of sizes. Coiled tubing has flexible coils, and is often used to supply air to moving machinery. The coils help prevent kinks and breaks. Bonded tubing—consisting of single, double and triple-bonded coils or straight tube—provides a strong, flexible, organized and color-coded grouping that makes installation neater and easier. Tubing is often used with push-to-connect (PTC) fittings. As mentioned, straight, coiled and bonded tubing are all specified based on outside diameter. This enables secure connections to push lock, PTC or other similar fittings. Hoses are commonly used for manual operations and are often dragged across floors, so they sometimes are manufactured with an integral nylon braid to add strength. Some hoses are made with heavier rubber and some with lighter weight polyurethane, among other materials, but all are made to be flexible, strong and kink-resistant. This makes hose a good choice to connect shop air for manual operations such as pneumatic tools and blowguns. Common hose inside diameters (ID) are 1⁄4, 3⁄8 and 1⁄2 in. Fittings use National Pipe Thread, or are quick disconnect. The following materials are commonly used to make pneumatic tubing and hose. Polyurethane is the most popular type of tubing used in industrial automation machinery. It is flexible, strong and resists kinking that may occur with other, stiffer tubing. Polyurethane’s working pressure is 150 psi or higher, which is adequate for most plant applications. It works well with a wide range of push-to-connect fittings due to its tight OD tolerance. To help identify pneumatic circuits and functions on a machine, this tubing is available in several colors, and some offer UV stabilization for outdoor use. Of the materials listed above, polyurethane and PVC tubing are the best choices for use in flexible applications. The durability and memory of polyurethane make it a good choice for self-storing, coiled and portable pneumatic hose applications. Although PVC is not as tough as polyurethane, it’s a good choice if low cost and high flexibility is required. PVC can also be specified in food-grade applications. Nylon and polyethylene are harder plastics than PVC, making them less flexible. However, this stiffer tubing works well for straight-run piping and air distribution around a plant or large machine. Nylon has several advantages in high pressure and high heat applications and when installed around caustic chemicals. It has a temperature range up to 200°F, a working pressure of 240-350 psi (depending on diameter), and excellent resistance to chemicals. While less flexible than polyurethane, it is strong, lightweight and works well with push-to-connect fittings and is available in a variety of colors. PTFE tubing has an even higher working pressure and more heat resistance than the other four types of material, along with excellent chemical resistance. It can handle temperatures up to 500°F and, depending on tubing diameter, can have a working pressure up to 372 psi. It is also flame retardant, and its good dielectric properties make it suitable for use in applications with electrical static and noise. This chemically inert tubing, available in a range of sizes, pairs well with stainless-steel push-to-test fittings. These NITRA fittings are an important part of a pneumatic system, and ensure robust leak-free connections. Push-to-connect fittings often have a strong thermoplastic or brass body, with stainless-steel tube-gripping claws. If threads are present on the fitting, they are typically nickel-plated brass. While this plastic/brass fitting is a good solution in most applications, if the fitting is to be installed in a high-temperature or wash-down application, stainless steel, all-metal push-to-connect fittings may be needed. Other materials should also be considered if the fitting will be directly exposed to fluids such as coolant, cutting or lubricating oil. QD fittings are typically used at the end of a shop air hose, and work well in situations where pneumatic hose needs to be connected and disconnected frequently. To maximize the range of motion of an air tool and allow freedom of movement for operators, use of a swivel style QD fitting is a good practice. These swivel styles can also can help prevent kinking and strain on the attached air hose. Two rotation points will allow full 360° circular and 45° angular rotation. An easy way to connect flexible tubing and hose is to use barb fittings, where the inside diameter of the tubing or hose is pushed over a slightly larger diameter barb. Although the barb fitting is simple to use, there is a risk of the tubing splitting, popping off the fitting or leaking. A hose clamp can be used to improve the connection, making it tighter and more secure. Compression fittings provide a very secure connection by using a small barrel-shaped sleeve called a ferrule. The ferrule is installed over the OD of the tube between the fitting nut and body. When the fitting is tightened, it compresses the ferrule, often permanently. This crimped ferrule can be difficult or impossible to remove, so it is often necessary to install a new ferrule, and to shorten or replace the tubing. Brass-threaded fittings consist of connectors, elbows, tees, bushings, and plugs. Although they don’t usually connect directly to tube or hose, they often act as a union, adapter or converter between thread sizes. They also provide a means to connect to a variety of miscellaneous pneumatic devices. Sometimes it takes more than a straight male connector or elbow to connect tubing between valves, cylinders and actuators. To address these situations, a variety of special purpose push-to-connect fittings are available to enhance integration, function and operation. One popular special fitting is a speed controller, also called a flow control valve, used to control cylinder speed. Check valves may also aid cylinder function and operation. Other special-purpose fittings combine pneumatic devices with push-to-connect fittings to create miniature versions of popular pneumatic system components such as hand valves, gauges, regulators, and quick exhaust valves. These special-purpose, push-to-connect pneumatic fittings can be used for testing and troubleshooting, or installed to permanently control machine functionality or monitor air usage. AutomationDirect can assist with the selection and specification of the many parts, pieces and components in pneumatic systems. Hose can be repaired, and repair kits are readily available. However, tubing is disposable. In fact, to prevent leaks, it is a good design practice to install tubing a little longer than needed as the end should be cut off every time it is disconnected from a PTC fitting. It is also good practice to always use a tubing cutter when cutting tubing or hose. Use of a knife or diagonal pliers can crush the tube and prevent a good seal at the PTC fitting, causing leaks. Tubing should also be cut at a right angle to the tube axis. After cutting the tube, it should be inspected for an even cut, and impurities such as dust and excess debris should be cleaned off before inserting into the fitting. Tubing should be inserted fully into the fitting. It is good practice to pull the tube gently after insertion to make sure it does not release. Users often have a difficult time removing tubing from a fitting. While the tubing can be difficult to remove, attempting to remove it under pressure is dangerous and makes removal even more difficult. Therefore, all pressure should be released before pressing the release ring at the end of the fitting and pulling the tube. It is important to avoid installing tubing under tension, or with a tight bend radius. Excessive vibration or rotation of the tubing can cause leakage or damage to the fitting. Tubing must also be protected from weld splatter as it could melt or cause a fire. Most fittings are only recommended for pneumatic systems, and other uses, such as water or chemical delivery, should be avoided. When it comes to tubing and hose selection, take the time to review the requirements of the application, and make use of different materials and colors as necessary. Take advantage of the wide variety of fittings available to properly integrate the pneumatic system. Following these guidelines will ensure your pneumatics installation works as designed. What was not mentioned were those wonderful tubing connectors with the PE ferrules that only need to be finger tight to hold very well at 100PSI. I have used many of them in the 1/4 inch size and I like them even more that the push in variety. The big benefit is that they can be disconnected and reconnected many times with no tendency to leak at all.